Hello everyone! So hard to believe we are winding down September, and heading into October! Crazy!! 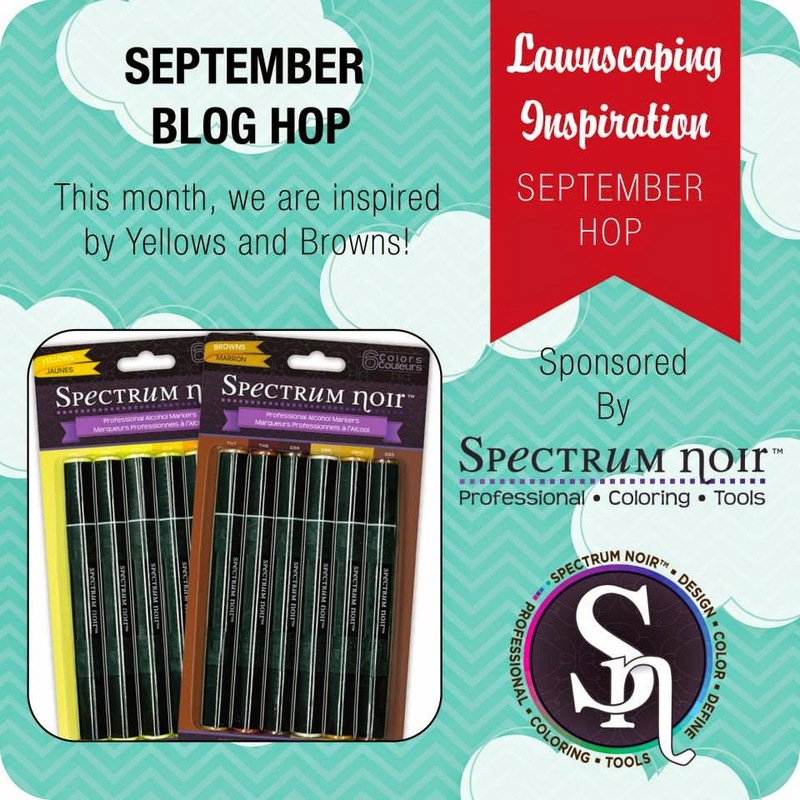 Today, the Lawnscaping Facebook Inspiration Team is bringing you more inspiration, and we are inspired by Yellows and Browns. This awesome hop is sponsored by the awesome Spectrum Noir. You should have found your way to me by the awesome Isha! 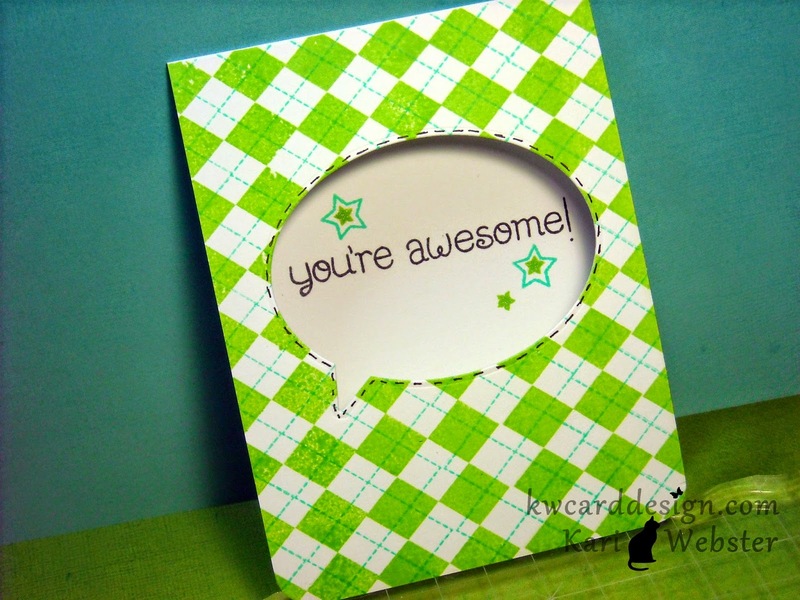 For my card, I pulled out some papers from Lawn Fawn's Sweater Weather 6x6 pad. One of my favorites for sure! I die cut both pieces of pattern papers I chose from the Large Stitched Rectangle Stackables dies! Love these too! They make a card quick and simple! 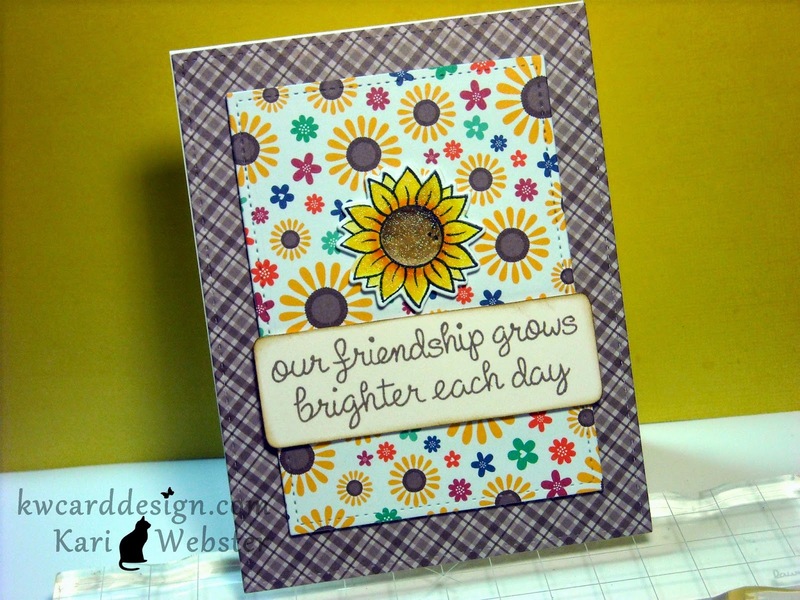 I stamped out my sunflower from Our Friendship Grows, and colored my flowers using some yellows and browns, with a 'dash' of orange to bring it all together. Once I was done coloring my flower, I die cut it out using the coordinating die, and added some shimmer using the Wink of Stella brush marker ( I am addicted). Then, I stamped out my sentiment with Memento Rich Cocoa ink, and cut it down to fit on my card and popped it up with foam adhesive! OK - time to send you off to Lenny! I am sure she has something awesome for you to feast your eyes on!! Be sure to leave comments for your chance to win some awesome Spectrum Noir Markers! Hi everyone! 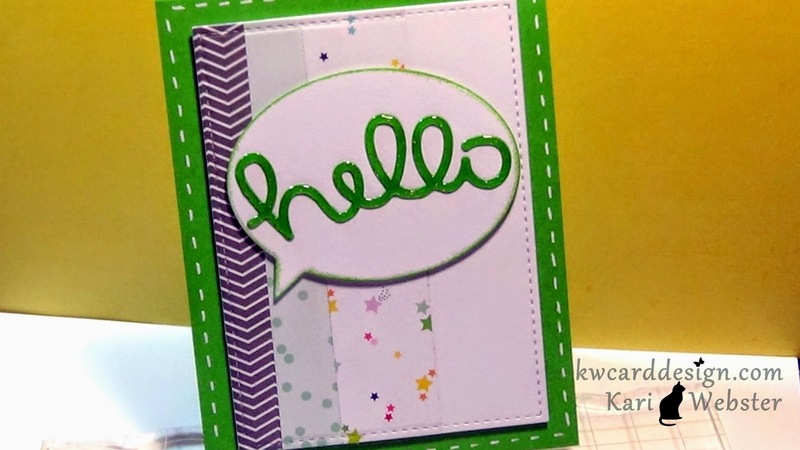 Kari here once again to share with you my latest card tutorial. I don't know about you, but I have lots and lots of pattern paper via my 6x6 paper pads. I NEED to use them. Lately, I really have not been using pattern papers, and not sure why I stopped, but I need to get back into using them up! So, for today's card, that is what I am doing. I have a video up on my YouTube Channel. If you are not subscribed, I would love it if you would. I will be having my 1000 subscriber giveaway soon once I hit this magic #, so I encourage you to subscribe! Well, Lets get to the card, and video shall we!? All the supplies used are linked below or over at my YT channel in the description bar. Thank you all so much for stopping by!! See you soon! Helllloooo :) Wow! And, here we find our selves with a new challenge for Lawnscaping! Crazy, huh?! Well, I know you all are gonna love the new challenge...we are getting Critter Crazy. Lawn Fawn is known for their Critters, because they are just so darn cute! 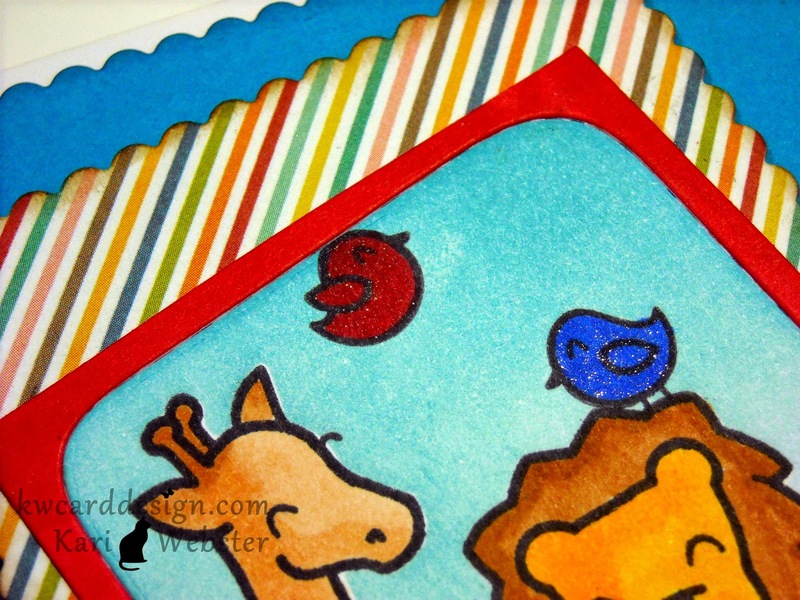 So, it is time to grab your Critters sets and make a fun project with them. I used three Lawn Fawn sets for this card. I used '#Awesome', 'Critters in the Savannah' and 'Gnome Sweet Gnome'. I first die cut the frame from '#Awesome' from some PTI Stampers Select White CS, and stamped giraffe and lion with some Tuxedo Black Memento Ink. I, then stamped the images again onto some masking paper, and masked them off, so I could add a blue sky using some Broken China Distress Ink. Once I was done inking, I removed my masks, and then colored them in with some Copics. I, then added the two birdies from 'Gnome Sweet Gnome' and also colored them in with Copics. I used the same Red Copic Marker to color in one of the birdies to color my outside frame. Then, I die cut a piece of patterned paper from an older Simple Stories paper pad, and some Island Blue CS using the scallop frames from Mama Elephant. Before adhering everything together I stamped my sentiment from '#Awesome' on my Island Blue piece in Versa Fine Onyx Black ink. I then adhered my frame onto my pattern paper, added some foam adhesive on the back, and then adhered that piece onto the Island Blue piece, and then onto my white card base. 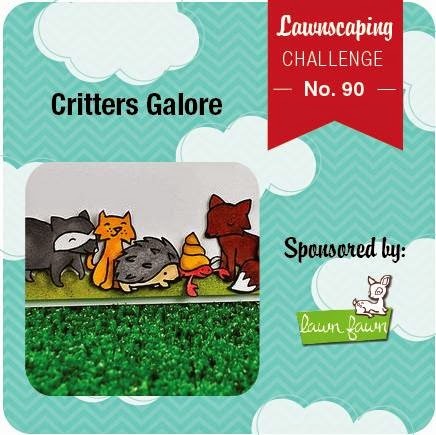 This fun challenge is sponsored by Lawn Fawn. They are far my favorite stamp company! So - be sure to link up your project for your chance to win for a $25 GC! And, so here we are! The 1st of September! My, my time is scootin' along fast! I am back to share with you my card for the latest Lawnscaping Challenge! 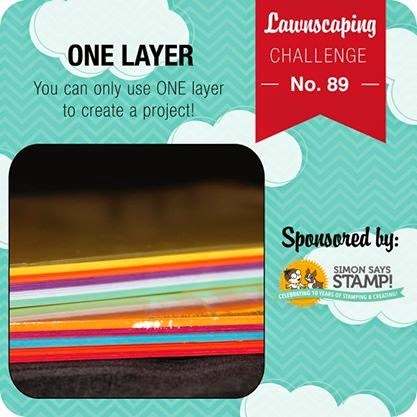 We are challenging you to make a one layer creation!! Before I get into my card, I want to let you all know that we are sponsored by Simon Says Stamp! 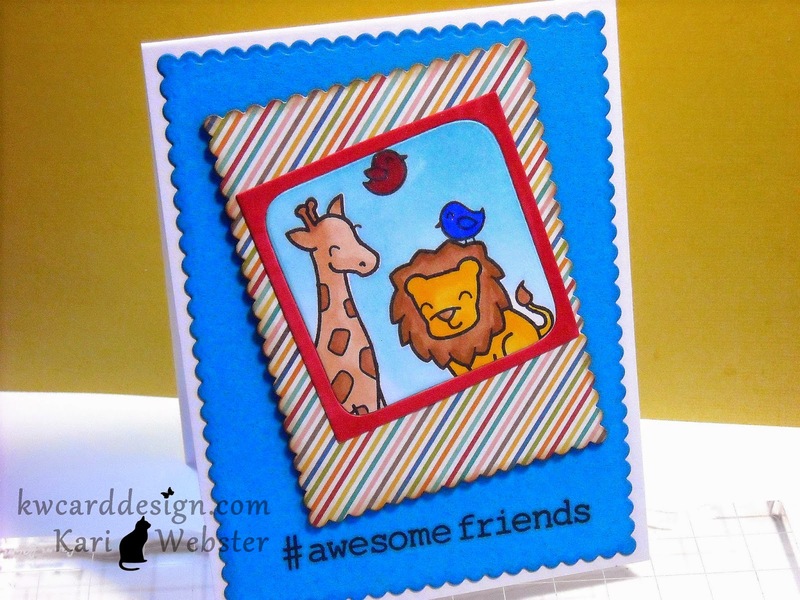 And, just in time for their fun month long Stamptember event!! Whoo hoo!! You could be a winner of a $25 dollar gift certificate! So, I wanted to ink up some of my new stamps of Lawn Fawn's release since I received them last week! One of those I was dying to ink up was Argyle Backdrops! This will be one of those I will go to again and again! I inked it up using Hero Arts Shadow inks in Green Hills and Tide Pool. Once I was done with my background, I took the large speech bubble die from the Large Stitched Journaling Card die set and die cut in the middle of my card. 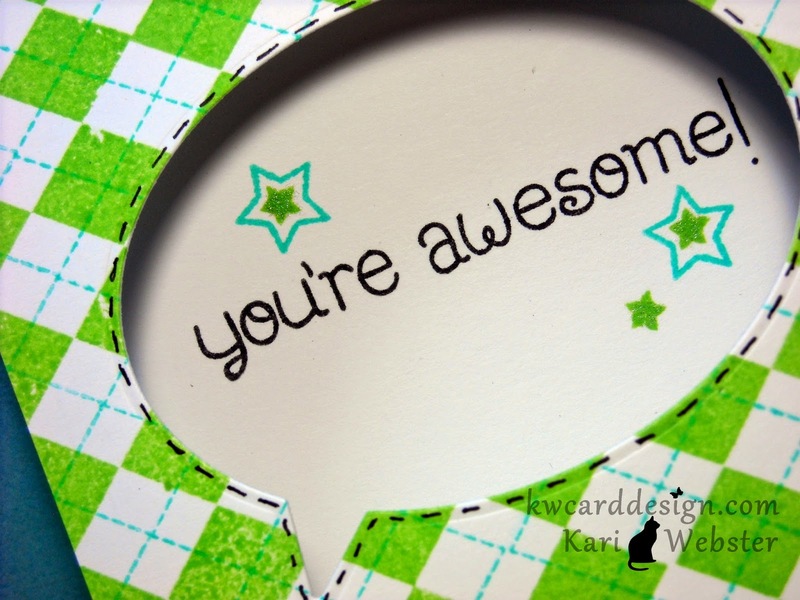 Then I stamped the 'You're Awesome' sentiment from So Much to Say stamp set in MFT Hybrid Black Licorice ink. I added some finishing touches to my card by stamping a few stars, adding a faux stitching around the speech bubble to make it stand out more, and of course a little shimmer to my stars using my Wink of Stella glitter marker. I also rounded the corners with my We R Memory Keepers Corner Chomper using the 3/8" round. I hope you are able to join us for this fun new challenge!! Can't wait to see the gallery on this one!! And, be sure to check back on with Lawnscaping on our Facebook page as the Inspiration Team will be there to give you more inspiration along the way!